First official movie poster for director Alfonso Cuarón's "Gravity" starring George Clooney and Sandra Bullock. Like the pull from a looming planet, the first trailer for director Alfonso Cuarón's "Gravity," starring actors George Clooney and Sandra Bullock as astronauts, draws in moviegoers. The one-and-a-half minute teaser, which Warner Brothers Pictures released online Thursday (May 9), provides a first glimpse at the highly-anticipated film, which has been in development since 2010. "Gravity" is scheduled to launch into theaters on Oct. 4, on the anniversary of the launch of the world's first satellite, Sputnik, in 1957. The trailer opens with an astronaut's view of Earth as seen from space. "Beautiful, don't you think?" Clooney remarks from off-screen. The seemingly-peaceful moment, now showing Clooney and Bullock in spacesuits, tethered together, floating over the limb of the planet, is quickly replaced with a torrent of violent shots, alternating between a space shuttle being torn apart, what looks to be the Hubble Space Telescope being significantly damaged and a Russian Soyuz capsule tearing through an exploding International Space Station. The sound of an ever-increasing heart beat serves as the backdrop to the next scenes of Bullock being thrown into open space. "What do I do? What do I do!" she yells, as Clooney replies over radio, "Grab a hold. Grab anything!" As the preview comes to an end, it is Bullock whispering "Anybody, please copy..." as she tumbles head over feet into the black void of space. A similar theme, underlined by the tagline "Don't Let Go," appears on the movie's first official poster, also released this week. The blue and black poster depicts an astronaut flailing backwards, his (or her) tether having snapped, as he or she falls away from the space shuttle amid a cloud of space debris. George Clooney and Sandra Bullock star as astronauts in "Gravity," director Alfonso Cuarón's new film being released by Warner Bros. Pictures on Oct. 4, 2013. Despite it featuring NASA spacecraft and spacesuits, the film sought little assistance from the U.S. space agency. According to NASA spokesman Bob Jacobs, the agency's only involvement was to arrange a phone call between the filmmakers and astronaut Catherine "Cady" Coleman. 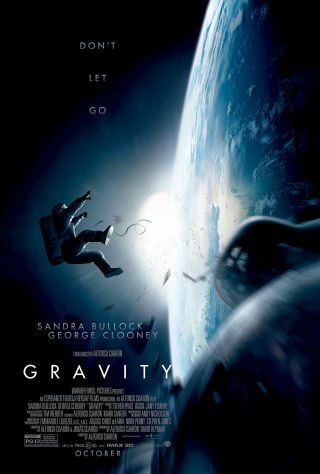 "Gravity" is Cuarón's first feature film since the Academy Award-nominated science fiction drama "Children of Men" in 2006. The son of a nuclear physicist, Cuarón has said in interviews that he always wanted to be an astronaut, as well as a director. This is Bullock's first "trip" into space. Clooney previously strapped on a spacesuit as astronaut Chris Kelvin in the 2002 sci-fi movie "Solaris" by director Steven Soderbergh. Warner Bros. will release "Gravity" in 3D and 2D in select theaters and IMAX. Click through to collectSPACE.com to watch Warner Bros. Pictures' first teaser trailer for Alfonso Cuarón's "Gravity" in HD.